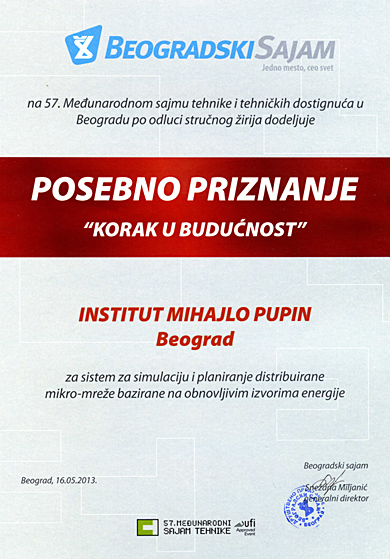 Jury of Experts of the 57th International Technical Fair awarded the Institute “Mihajlo Pupin” with A STEP INTO THE FUTURE, the traditional prize of the International Technical Fair, for System for simulation and planning of the distributed micro-grids based on renewable energy. The awarded solution is the result of the work on the project TR 32010 – SOFIA (Software Framework for Intelligent and Adaptive Management of Complex Facilities) lead by Prof. Sanja Vranes, scientific advisor and Managing Director. Post Published : 20. May 2013.